In early September Centurion was announced as Woolworths’ Large Carrier of the Year for 2018. 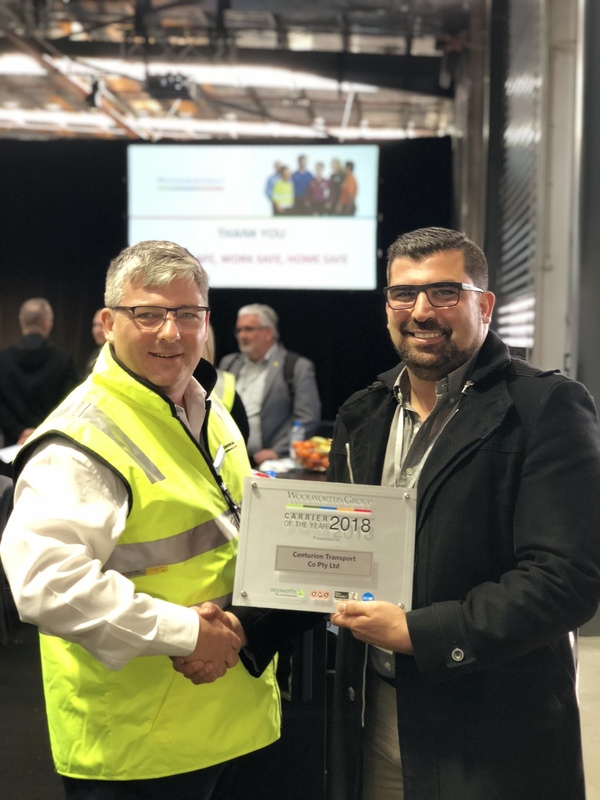 The highly prestigious award was presented to Centurion CEO Justin Cardaci at Woolworths’ sixth annual Transport Safety Day hosted at the company’s new automated distribution centre in Dandenong South. The award is presented to a company that has delivered an outstanding performance in safety, compliance and service. Mr Cardaci said the award was an acknowledgment of the hard work and dedication of the Centurion team. Woolworths’ Head of Contracts and Commercial Rob Agnew with Justin Cardaci at the awards presentation. Centurion was praised for its safety and its commitment to servicing its customers. During the cyclones and floods in the North West earlier this year, Centurion went above and beyond by commissioning a barge and redirecting road freight through the ports of Dampier and Broome to ensure vital supplies could be delivered to the Broome store and local community. Centurion loaded seven refrigerated trailers of produce on to a barge at Dampier port to arrive in Broome two days later and then used our local fleet to distribute the goods to the local supermarkets. You can read more about the barge move here. Centurion’s investment in Seeing Machines throughout its fleet was also recognised. General Manager International and Domestic Transport, Chris Brooks, said Woolworths takes safety seriously in every aspect of their transport business. “We work closely with our transport providers to continually improve road safety so everyone can return home safely to their families every day,” Chris said.